My uncle is a carpenter. (You can see one of his pieces that I hung with a french cleat). Several years ago he taught me how to work with wood by helping me build a custom bookcase. Because of him, the bookcase was very well-made and it’s been a treasured piece of furniture ever since. When we moved into our home, I found just the place for it. The bookshelf fits perfectly on a small wall in our front room that leads to the hallway. It’s narrow enough to be perfect for that walkway. But it never looked good there. It was big and dark, but not the focal point of the room. Even though there was plenty of space to walk by it, the bookshelf visually blocked the doorway. It also added one more type of wood to the room. We have honey oak floors and several pieces of mahogany furniture (like our mid-century cabinet and giant clock), so this bookcase in English Walnut looked out of place and messy. I tried restyling it several times, but it just looked like a decorating black hole. This post contains affiliate links for your convenience. For more information, read my full disclosure. 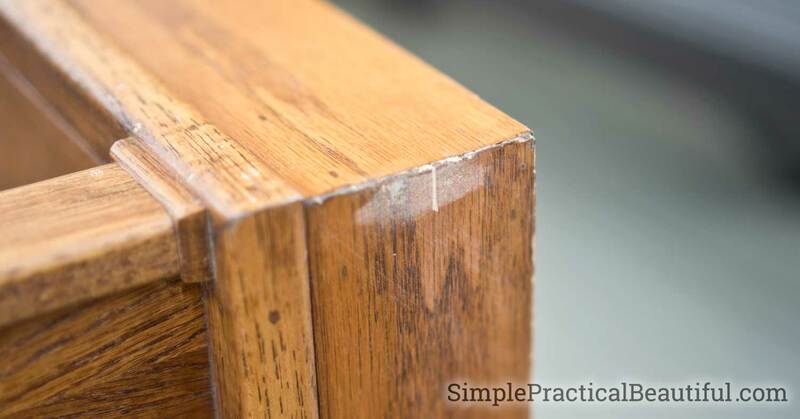 The most important part of any refinishing job is to prepare the surface to be painted, otherwise the paint will peel off. I took our bookshelf outside to prep it. You can see my cute husband watering our succulent garden in the background :). First, I washed the bookshelf by wiping it down with soapy water, then rinsing it with a damp rag. This is to remove any dirt or grime that has built up on the furniture over years of use. Next, I used wood filler to fill all the holes and scratches in the wood. This bookshelf has moved to different homes with us several times, so it had a little wear. The wood filler hides all that. After sanding the wood filler smooth, there’s going to be dust. I vacuumed the entire bookshelf just to be sure there wouldn’t be any dirt or nasty stuff in the paint finish. 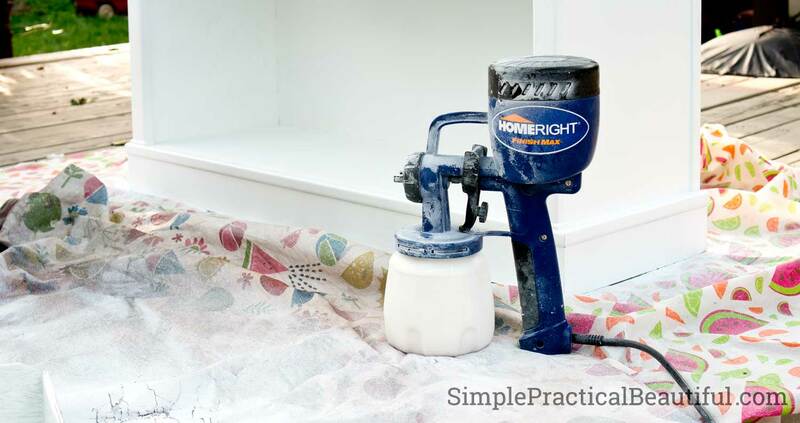 I used a HomeRight Finish Max Sprayer to apply latex paint to furniture. Spraying gives the best finish. But even if your brushing or rolling on the paint, you need a space that can get a little messy. And where the furniture can sit while the paint dries. I use our deck. It’s outside, so a little mess won’t matter much. And the deck will need a new coat of paint every few years anyway. I put the bookshelf up on my saw horses so it would be easier to work with and less likely to get dirty. I painted the first couple coats of paint with it up like this. The last few coats, I put the bookshelf upright on a drop cloth. The reason for changing things up is that paint loves a flat, horizontal surface. 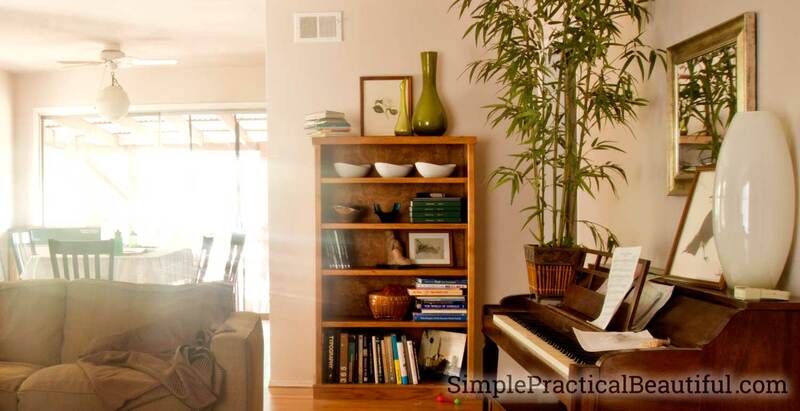 Changing the bookshelf means that vertical surfaces become horizontal and vice versa. That way I could focus on getting a solid, even coat of paint on whichever surface happened to be horizontal without worrying about drips. Latex paint is soft even after it’s dry. It can be scratched, chipped, and get indents. I added Hard Coat to my latex paint to make the bookshelf more durable. (I do have a 3 year-old.) 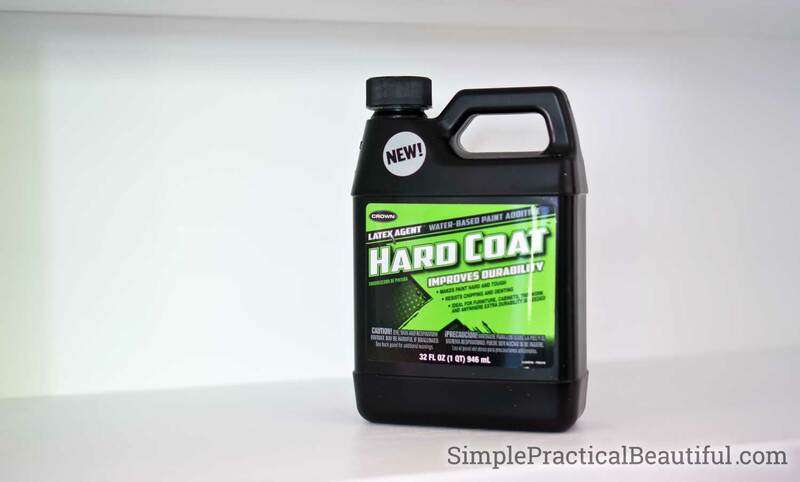 Hard Coat makes the latex finish more like a traditional enamel finish. It’s also great for painting kitchen cabinets. I added the instructed ratio of Hard Coat to paint and then thinned it a little more to be the right thickness for the paint sprayer. Now the fun part, painting the furniture. I love watching an old piece of furniture transform into something new and beautiful. Using a paint sprayer has made refinishing so much easier, and it makes the final finish so smooth flawless. I love my HomeRight sprayer. 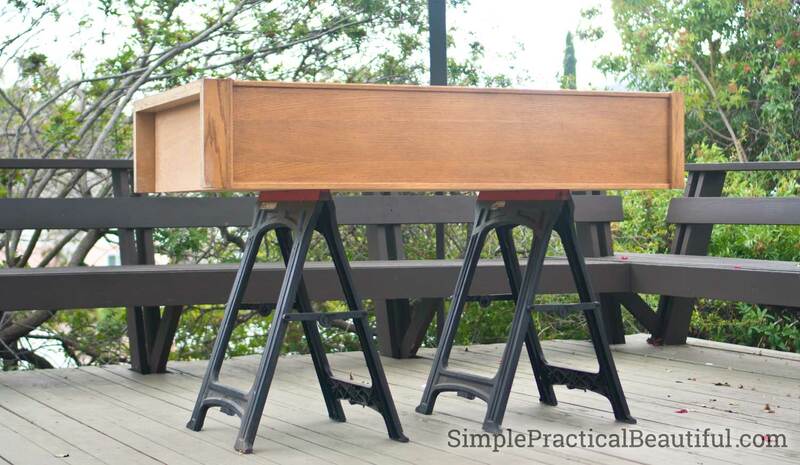 The trick with a paint sprayer is to applying several thin coats, just like with spray paint. That’s why the bookshelf needed to be somewhere it could sit and dry. It took me about a week of painting a coat, then letting it dry, and repeating. Technically, latex paint and other finishes don’t dry. That would mean that water is evaporating. They cure, which means that the air causes the paint to change, or harden. I’ve found that if I don’t wait long enough between coats, the final finish never cures completely. It stays a little sticky. Be patient. It’s worth it. My finished latex paint feels more like a hard enamel finish thanks to the Hard Coat additive. I’ve never had this happen before, but the wood grain showed through the paint. Not the color of the wood, just the grooves from the grain. I guess this must have been my first time painted something oak that didn’t have a thick finish that filled the grain. I could have used a wood grain filler before painting to prevent this, but I kinda like the texture it gives the bookshelf when you look closely. My “new” bookshelf looks great in our living room. It add decoration to the wall without drawing a lot of attention or taking up a lot of visual room. 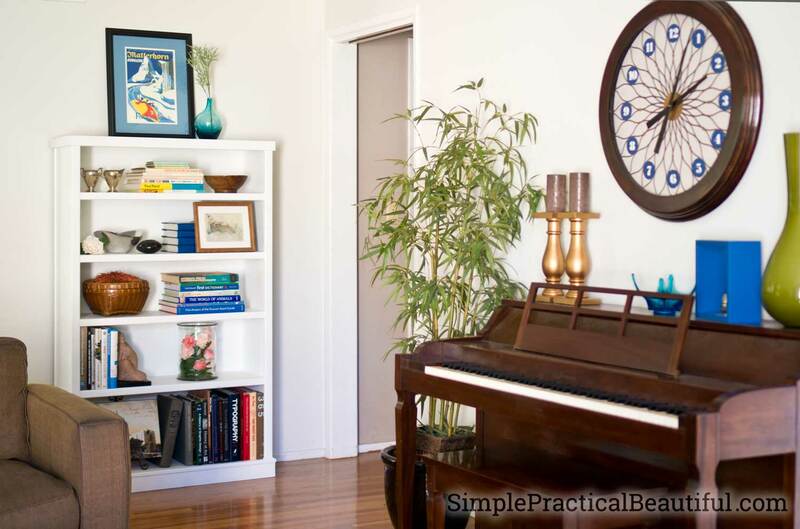 A design tip: If you want a piece of furniture to be less noticeable, paint it a similar color to the wall. 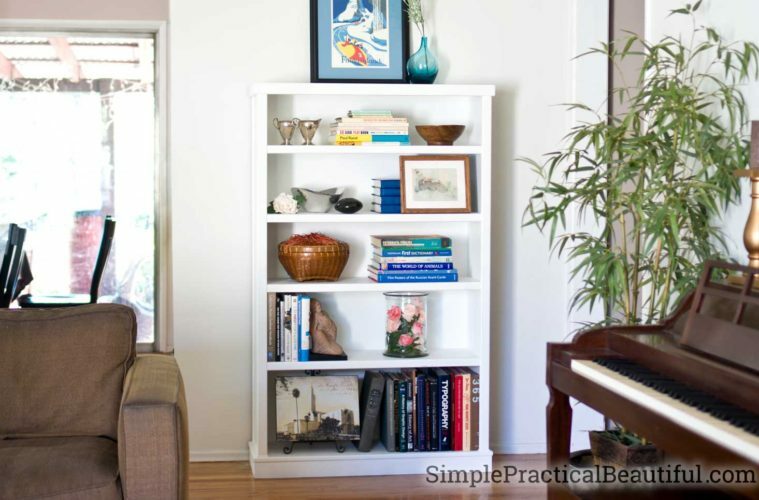 I was a little worried about having white on white, but I love how the bookshelf looks next to the wall. Now I’m working on decorating it. 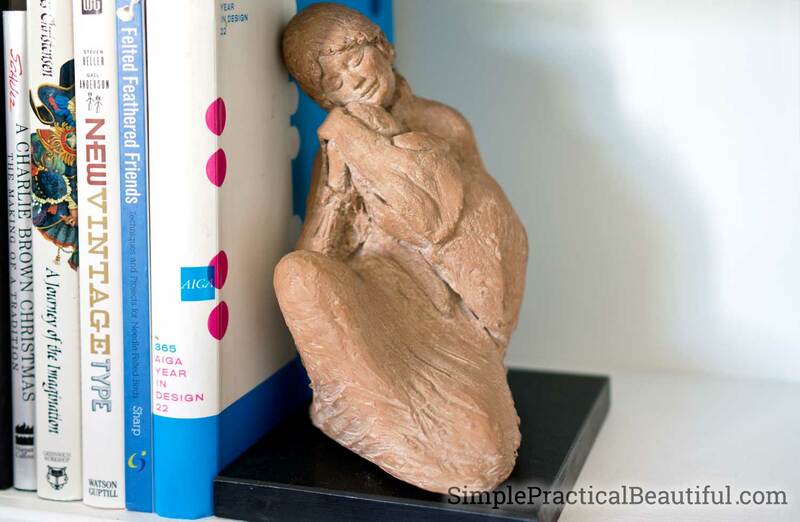 I have a few pieces that are sentimental, like this sculpture of a mother and baby that used to be my mom’s. 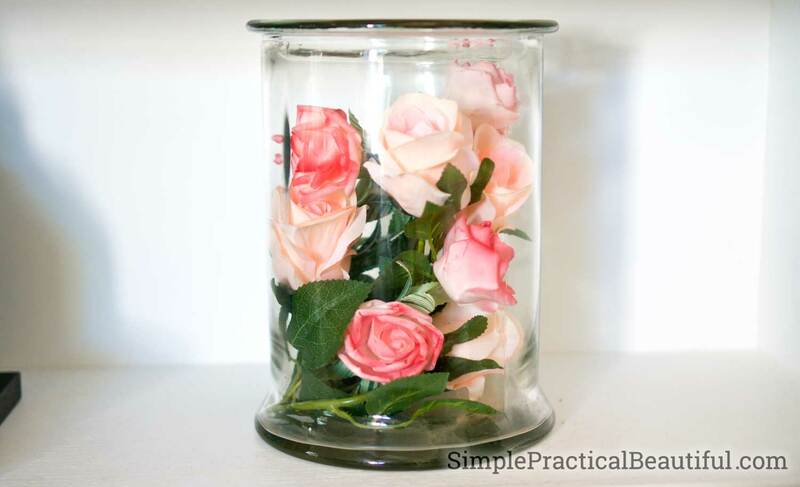 I’m also working on making a few DIY decor items to display on my bookshelf and around the room, like this glass vase with silk roses. 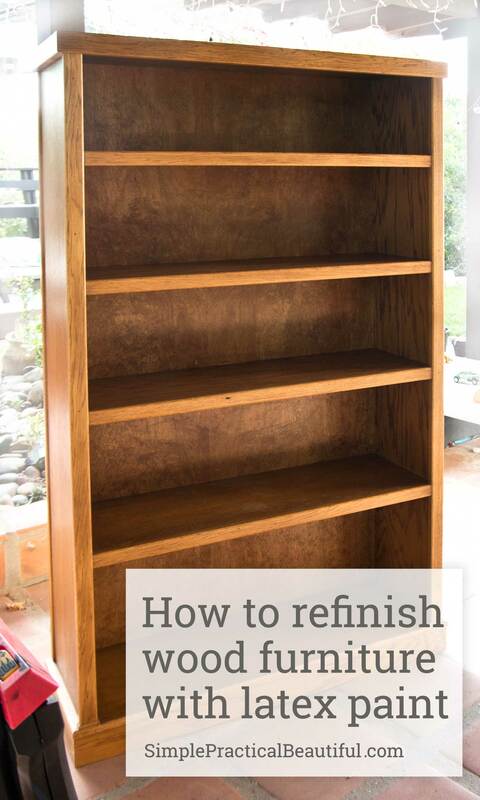 Refinishing wood furniture is a fun and simple DIY project that brings new life to old, worn, outdated, or ugly furniture. You can read more about the how we refinished the large clock or how I quickly and easily dust that silk plant. It looks fantastic Rebecca! You know I’m always screaming about the power of paint. 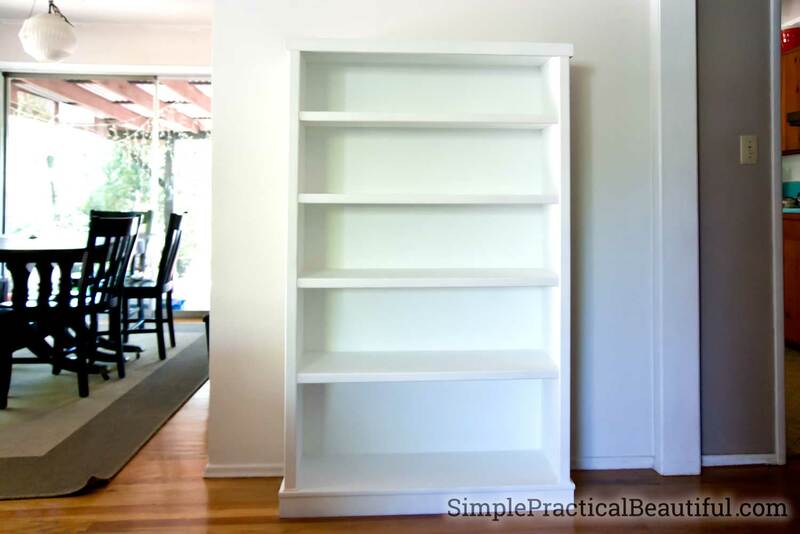 The bookcase looks fresh and clean against the wall and doesn’t create a black hole as you call it. 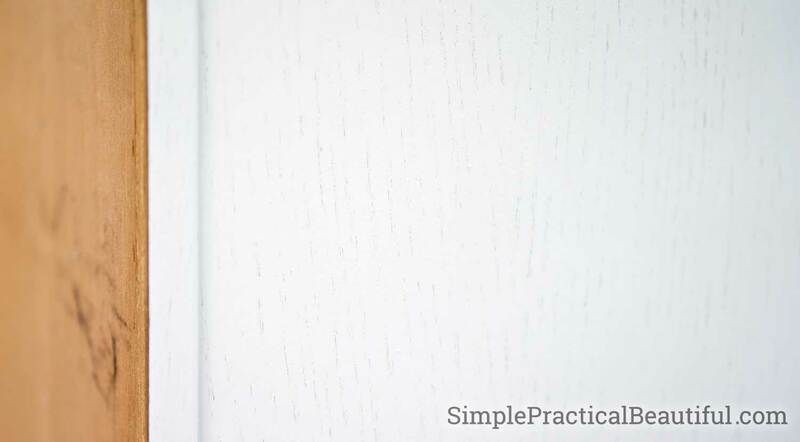 I too like the grain showing subtly through the paint. It creates interest. Happy accidents are the best! 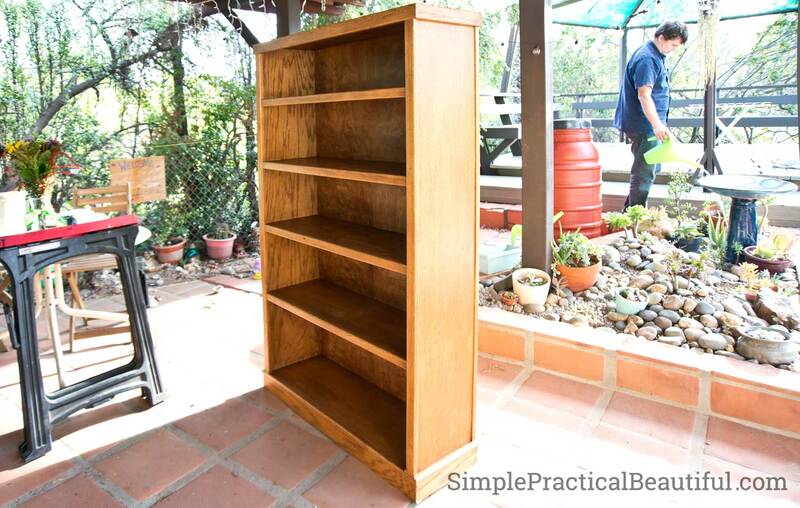 Excellent article … I have a similar massive bookcase that is brown and ugly and it’s being moved to a wide hallway. I’ll do exactly what you did ! It looks great !! Now it’s not just a bookshelf, it added beauty in your living room. I love how it turned out.